How to Uninstall Foreign Language Fonts with Windows 7 You can't. According to Microsoft, there are over 40 new fonts included with Windows 7. Most of these allow Windows to support additional languages and writing systems. You can see the full list of fonts included with Windows 7 at the Microsoft Typography site. If you try to uninstall these fonts using the Windows Control Panel, you will likely run into a message box similar to the one pictured below. You will encounter this dialog even if you are an Administrator and have full access rights to the file. So how can you remove these fonts? The bottom is line is you cannot easily remove the foreign language fonts in Windows 7. Windows 7 considers these to be user interface fonts, as opposed to content fonts, and restrictions have been put in place to prevent uninstalling these files. The font files themselves are protected against removal by the Windows Module Installer service. This is a service that runs in the background and it is part of the Windows Resource Protection mechanism to prevent system file changes. 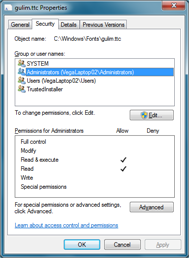 Fonts that are protected by WRP are restricted by Windows Access Control Lists (ACL). Typically, both Administrators and Standard users will have read only access to the files. 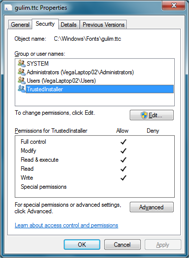 Only the TrustedInstaller account will have Full Control of the file. You can check the access rights on a file using the following steps. In the example below, we are looking at the rights for the Korean font Gulim (gulim.ttc). To determine if a font file cannot be uninstalled due to Windows Resource Protection. Using the Control Panel, open the Fonts window. Right click a font, Gilum Regular for example, and select Properties. If there is no Properties item on the menu, double click the font file to see all the fonts in the Family. In the Properties dialog, click the Security tab. In the Group or user names list, click Administrators. You will see that members of the Administrators group have read only access to the file. 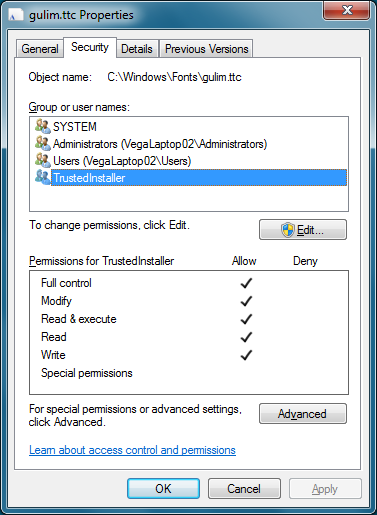 Now select TrustedInstaller In the Group or user names list. Notice how this account has Full Control rights to the file. If a font has the TrustedInstaller user attached to it, it is protected by Windows Resource Protection and you should not attempt to remove it. There may be a way to remove the font by granting ownership of the file to Administrators and denying access to the TrustedInstaller. But this may de-stabilize your system and we don't recommend attempting it. Which fonts cannot be uninstalled due to Windows Resource Protection? Using a script, we were able to build a list of protected fonts for a copy of Windows 7 preinstalled on a Dell laptop. On this laptop, we only have US English installed in the Region and Location section of the Control Panel. 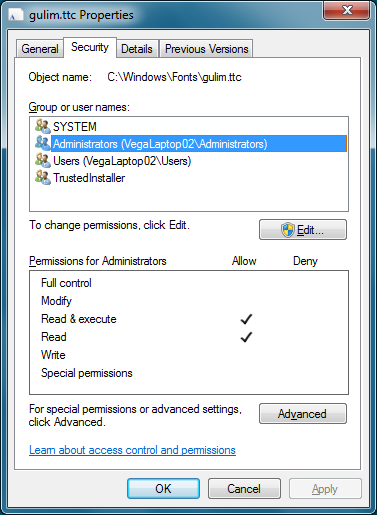 If you have additional Locations setup in Windows, there may be additional uninstallable fonts on your PC. The list of fonts we found is presented below. It is in a textbox so you can easily copy the list if needed. As you can see, there are a lot of protected fonts in the list. Hopefully Microsoft will provide an easier way to manage these fonts in a service pack or future version of Windows.